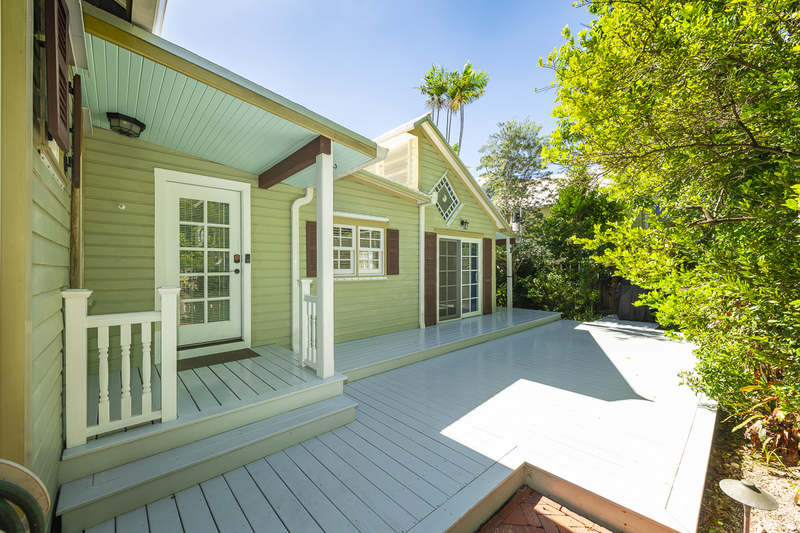 In most cases you can change the exterior colors of your Old Town Key West home if you go about it the right way. The process may seem a bit complicated, but it will save you time and money if you follow the rules and procedures. You will have to submit a completed application for painting/repainting to the Building Department counter at 1300 White Street—by the parking lot entrance to City Hall—along with a current photo of part of the house that will be painted, a photo of the structure from the street/sidewalk, paint chips, descriptions of painting to be done and the $10.00 staff approval fee for residential painting. You can download the required HARC application at www.cityofkeywest-fl.gov/egov/documents. The painting of Key West’s historic homes is overseen by HARC (Historic Architectural Review Commission). HARC’s design guidelines in Key West’s Historic District are intended to preserve and protect the architectural environment and unique character of its historic neighborhoods—Key West’s #1 tourist attraction. There are many structures outside of the historic district that are contributing to the historic district and HARC has jurisdiction on all exterior changes to the buildings. HARC’s Historic Architectural Guidelines for the City of Key West are available on the city’s website at www.cityofkeywest-fl.gov. To confirm if your home is under HARC regulation contact the HARC staff at HARC@cityofkeywest-fl.gov. While most wood frame buildings in Key West were historically white or unpainted, the use of muted colors may be approved by HARC. The colors below are recommended by HARC as appropriate within the historic zones. Other colors may be used if supported by historical documentation, or by evidence of underlying paint. HARC suggests when choosing colors to try and select a combination that will highlight the architectural details of the building. 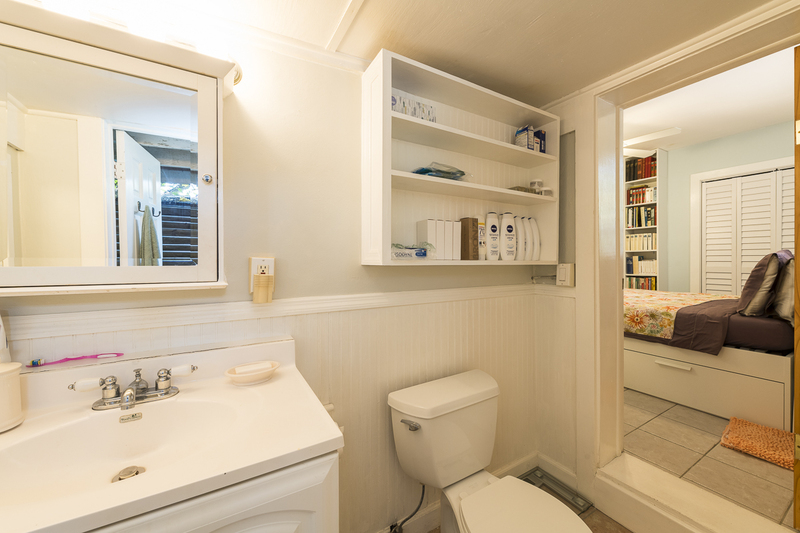 Typically, one color for the body and one for the trim will bring the architectural details into focus. Additional colors may be appropriate for subtle highlighting for porch ceilings, porch floors, foundations, etc. HARC recommends saving paint chips of significant contributing historical buildings so that a paint analysis may be done to determine the appropriate historical colors. To help preserve the cultural heritage of Bahama Village, the contemporary addition of brighter Caribbean colors may be acceptable within this neighborhood of the Historic District. Colors for new proposed additions that stand out from a contributing building or its neighbors are prohibited. If a new addition for a non-contributing structure proposes colors different from the main building, the colors need to be harmonious and like ones found within the adjacent urban content. 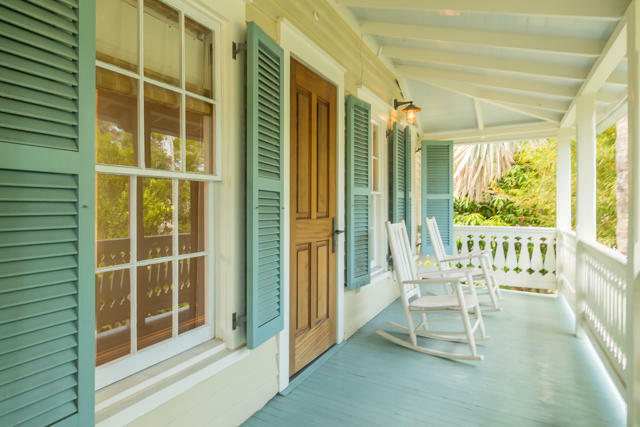 If you haven’t decided on your Key West cottage’s color scheme, you might want to wander around Old Town snapping pictures of historic homes sporting color combinations that speak to you. Pickup a selection of paint chips with HARC approved historic colors at Strunk Ace Hardware on Eaton Street and play with color combinations over a glass of wine with friends and neighbors. Once you have decided on the perfect color scheme head over to City Hall and get the permit process rolling. This entry was posted in Homes We Love, Key West Real Estate, Key West Real Estate Advice, Painting Your Key West Home and tagged Classical Revival Architecture, Florida Keys, front porches, gingerbread, homes, Key West cottage style, Key West cottages, Key West estates, Key West history, Key West painting rules, key west real estate, Key West Renovations, Old Key West, Old Town, real estate, Victorian gingerbread on January 30, 2019 by Dean. 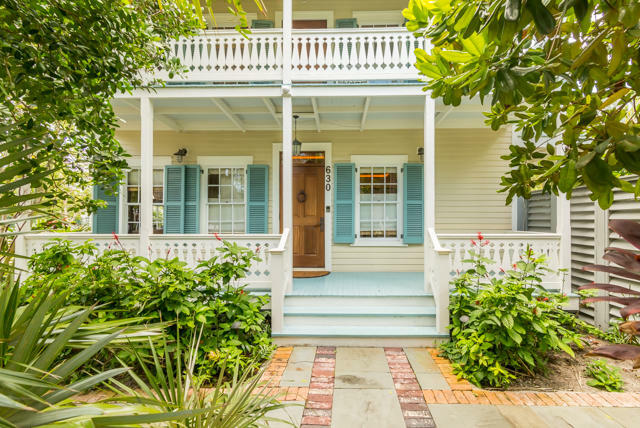 A stately Classical Revival mansion, a charming Bahama Village cottage and a stellar Old Town investment property shine brightly on the fifth annual list of our favorite Key West home sales. Not only did we wish we were buying these beautiful properties for ourselves, family or friends, we had a wonderful time working with the REALTORS®, buyers, sellers, closing attorneys, loan officers, photographers, and all the industry professionals that helped make these transactions happen. 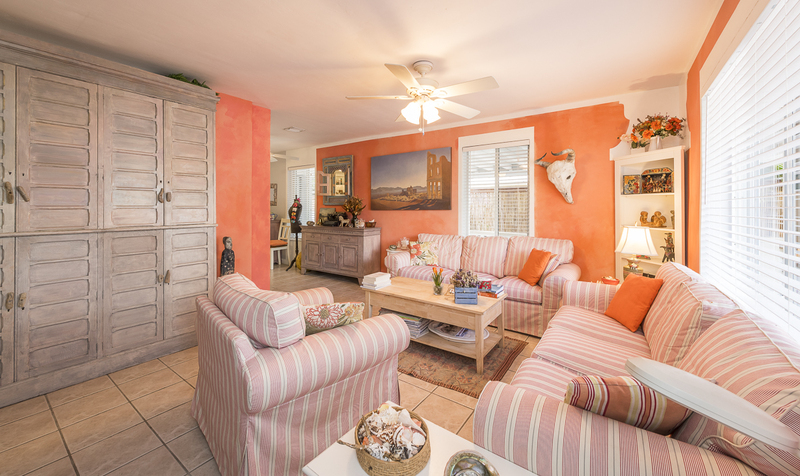 • 1011 Windsor Lane, Key West, FL 33040—SOLD $989,000. 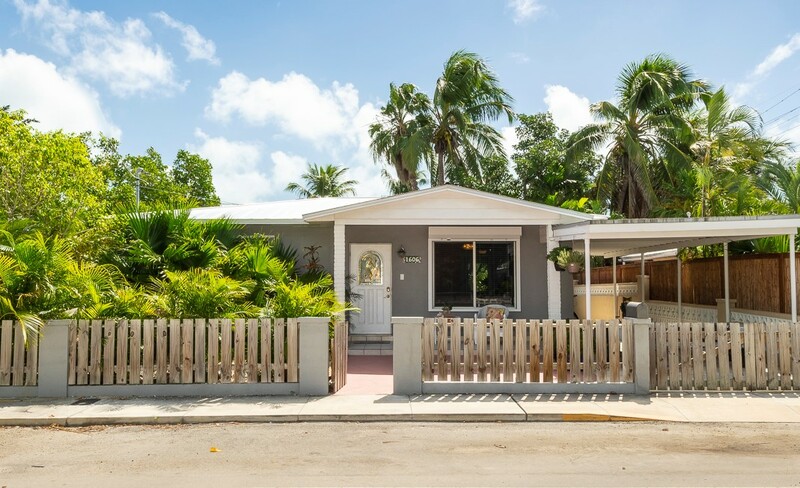 After unsuccessfully attempting to buy this Classical Revival fixer-upper, our buyer teamed up with us to successfully purchase his Key West dream home. We can’t wait to see him polish this historic gem to its former glory. 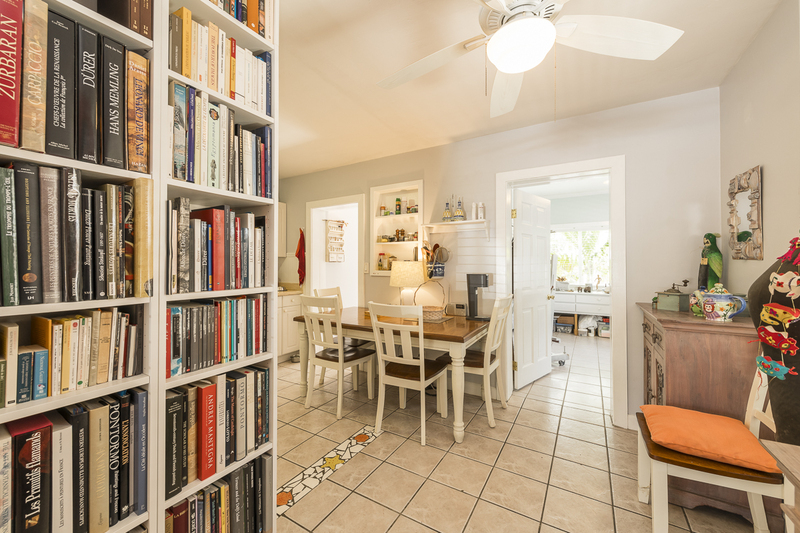 • 2601 South Roosevelt Boulevard, 107A, Key West, FL 33040—SOLD $400,000. Since you can’t throw a conch shell down an Old Town street without hitting a real estate agent, we were delighted when our friend called on us to help him purchase his Key West By the Sea condominium. 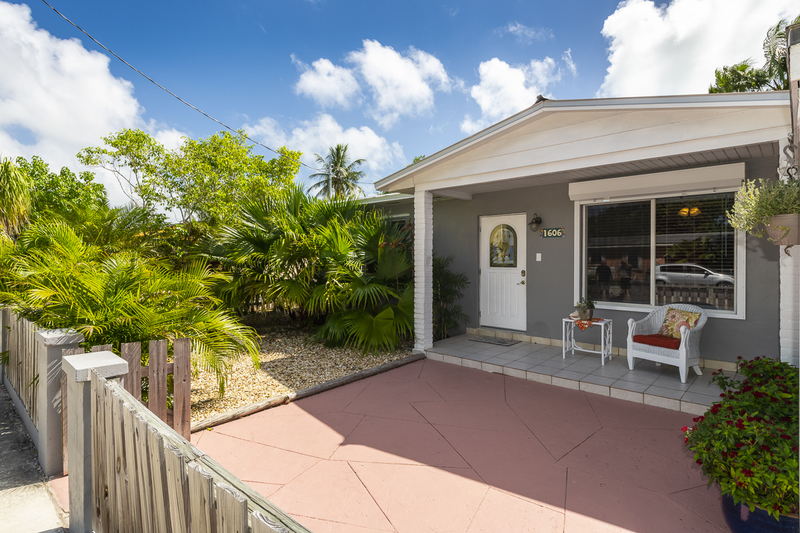 After convincing him that even though he was over eighty he could qualify for a mortgage, we made a winning offer and celebrated the closing of his “it’s never too late” Key West home. 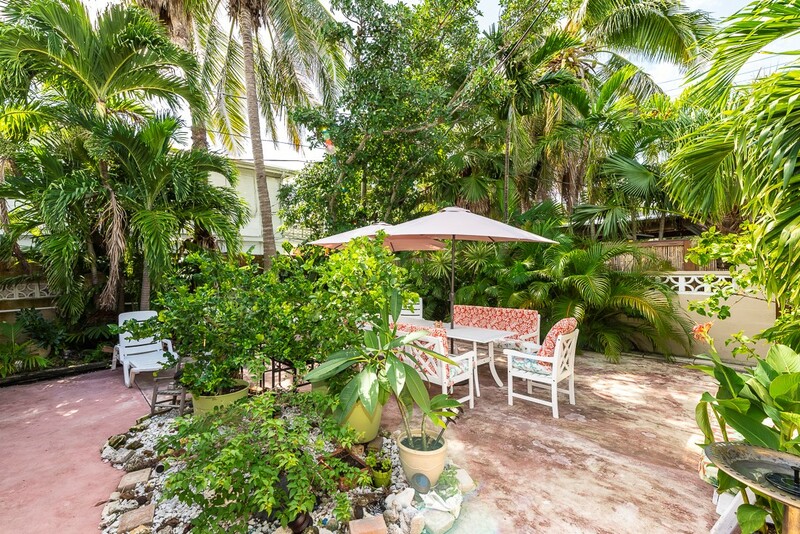 • 1800 Venetia Street, Key West, FL 33040—SOLD $968,250. 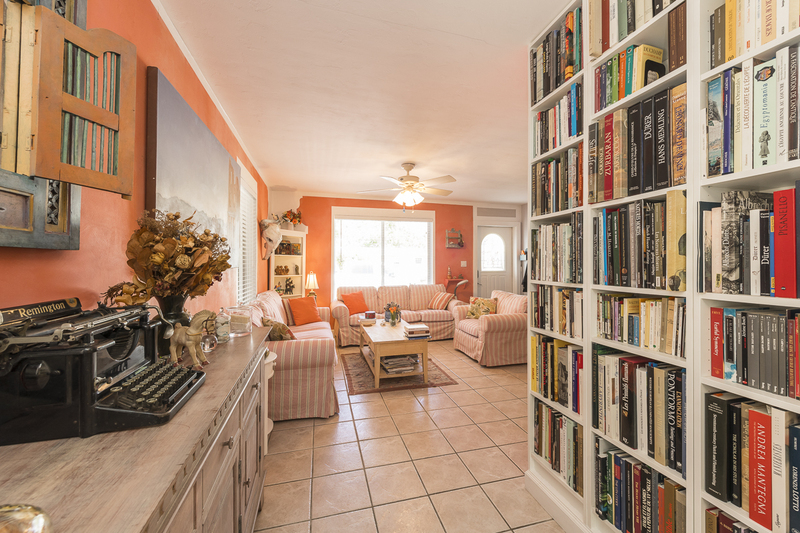 Our social media focused marketing campaign paid off quickly for the seller of this generous Midtown Key West home. After having his listing flounder with another agent for years, he was very happy with our creative approach for getting his family-friendly property sold. 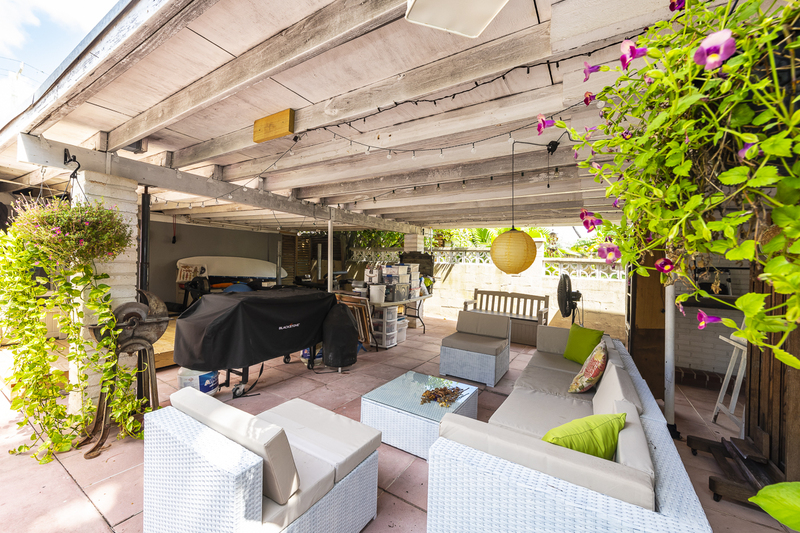 • 714 Chapman Lane, Key West, FL 33040—SOLD $915,000. 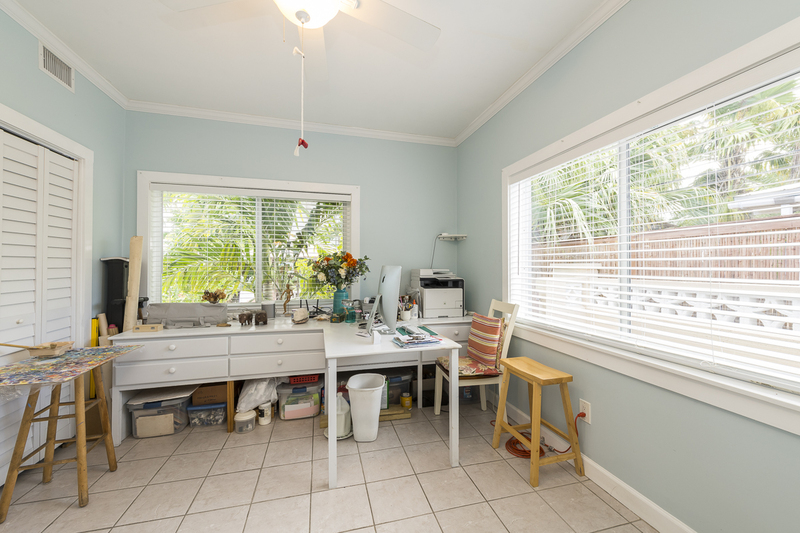 After getting to know us through our online marketing presence, our buyers contacted us to help them find an investment property that would eventually transition to their permanent Key West home. 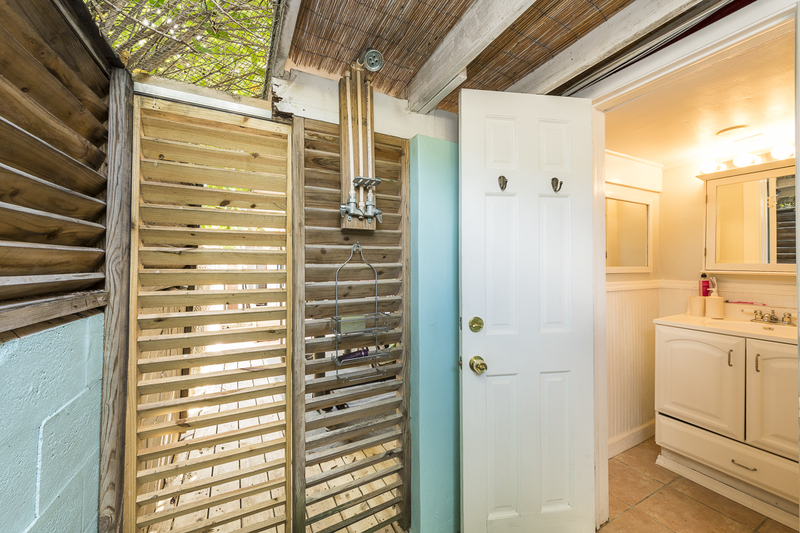 We immediately thought of this beautiful Bahama Village cottage—and it was love at first sight for our buyers. They are thrilled with the strong numbers their inviting monthly vacation rental is delivering. 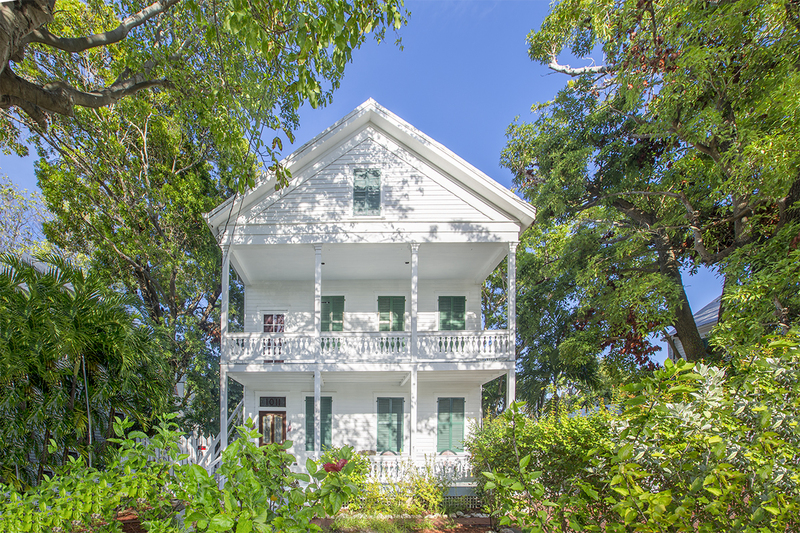 • 726 Olivia Street, Key West, FL 33040—SOLD $669,500. 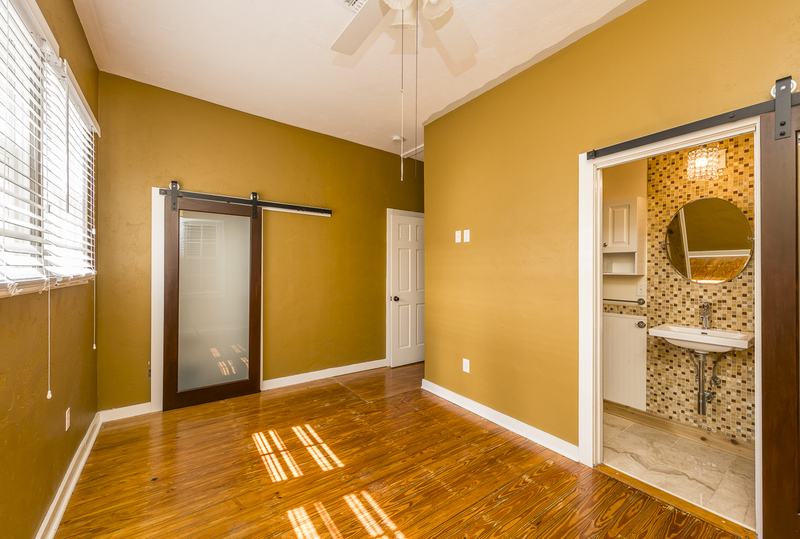 This picture-perfect, one bedroom and one bath, Old Town cottage was the ideal fit for our buyer. 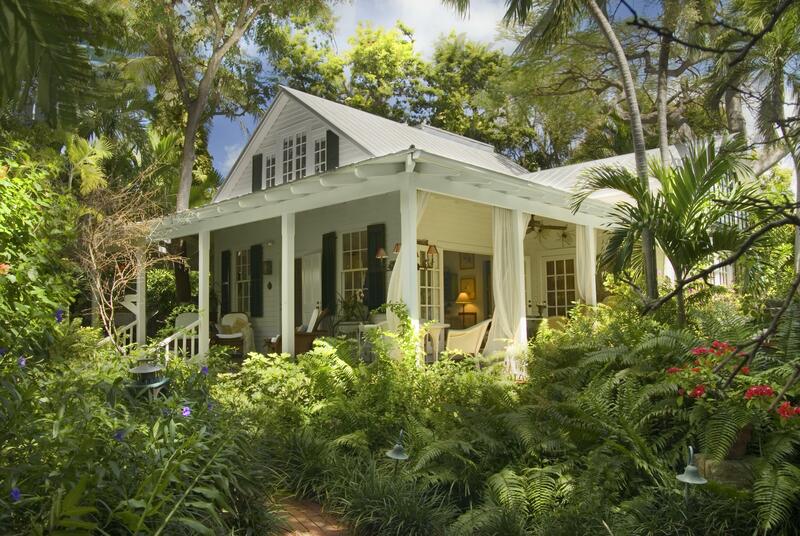 We were delighted to help our friend—and long-time Key West restaurateur—purchase her first home. Working together was so much fun, we didn’t want it to end. 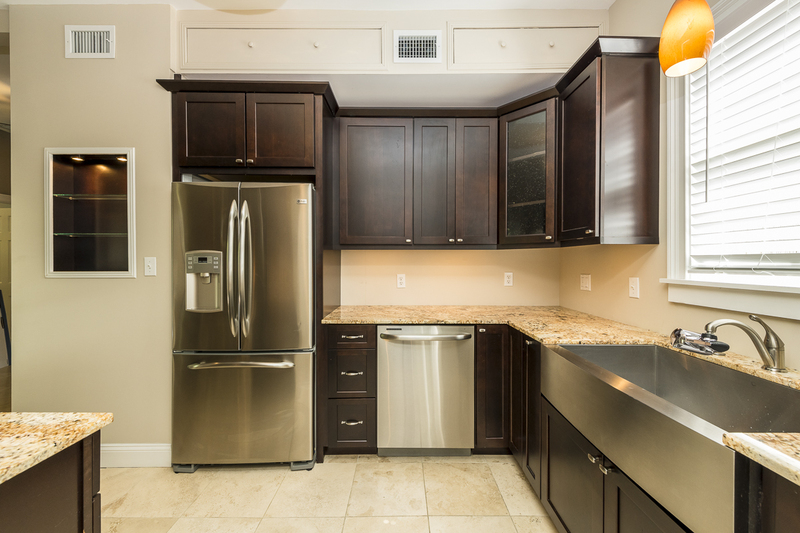 • 515-517 Margaret Street, Key West, FL 33040—SOLD $1,340,000. 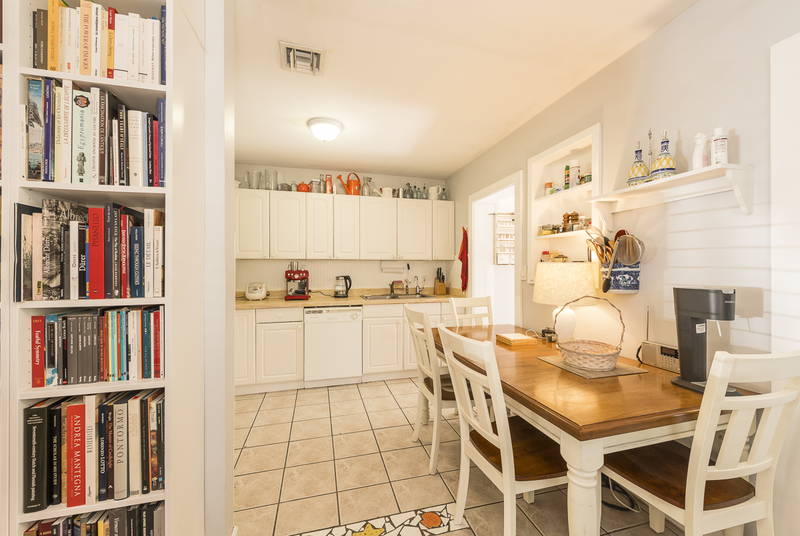 When we first experienced this exquisitely renovated (four bedroom and four and a half bath) Old Town property, we were determined to find the buyer. With its two single-story cottages, dynamite location, and amazing flexibility, we knew this historic property would undoubtedly prove to be a coveted monthly vacation rental. 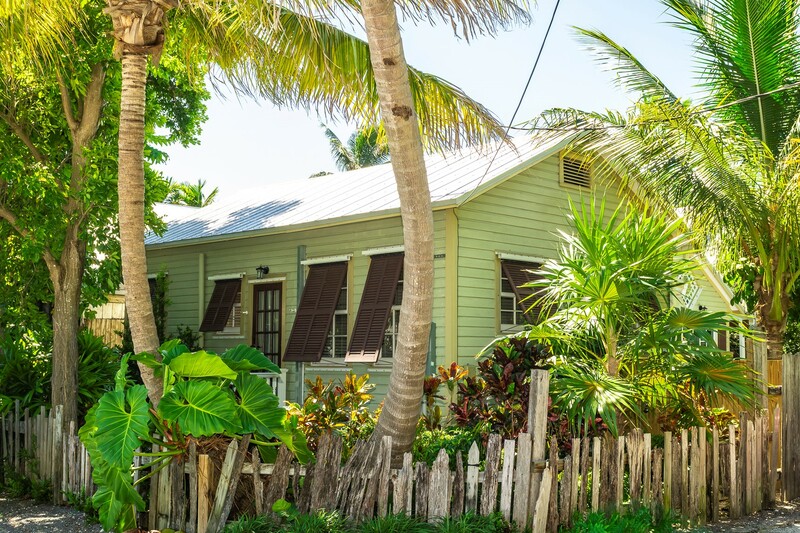 On the search to discover their perfect Key West investment property, our buyers saw the homes’ great potential and happily closed on their property in December. Whether your home is one of Key West’s crown jewels, a hidden gem, or a diamond in the rough, our laser focus, refined selling skills and proven strategy for marketing online and through social media will get your home sold fast and for top market value. We don’t just list properties, we market and sell homes. 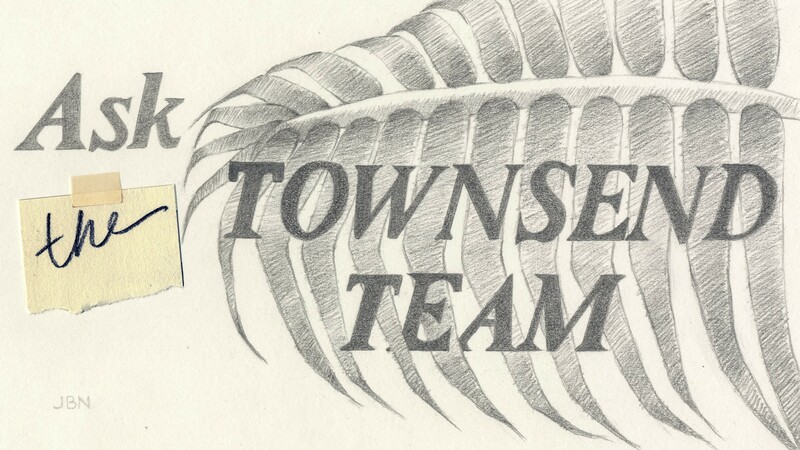 When you team up with The Townsend Team to discover your Key West dream home, we focus on you—your goals, priorities, investment and dreams. On your journey to realize your vision, we’ll be there for you every exciting step of the way. We bet you will love living in Key West as much as we do! 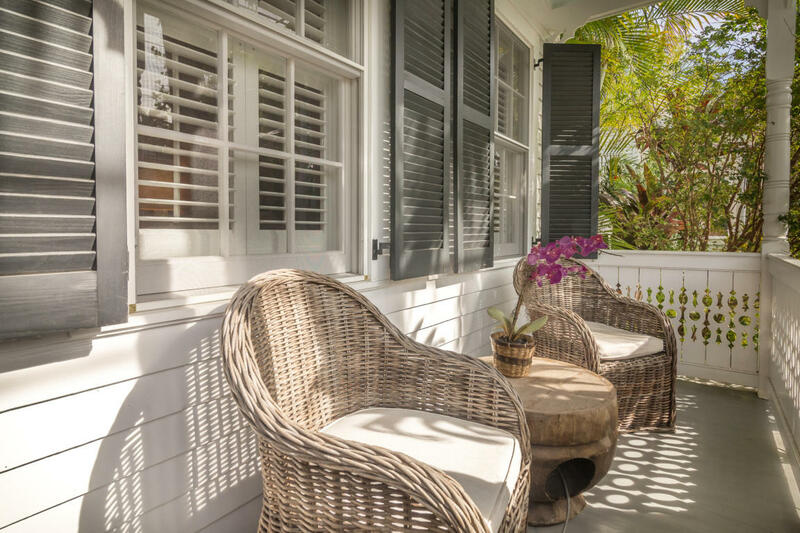 Having been involved in more than 250 real estate sales, we have the experience, knowledge, skill and dedication to be your Key West REALTORS® of choice. 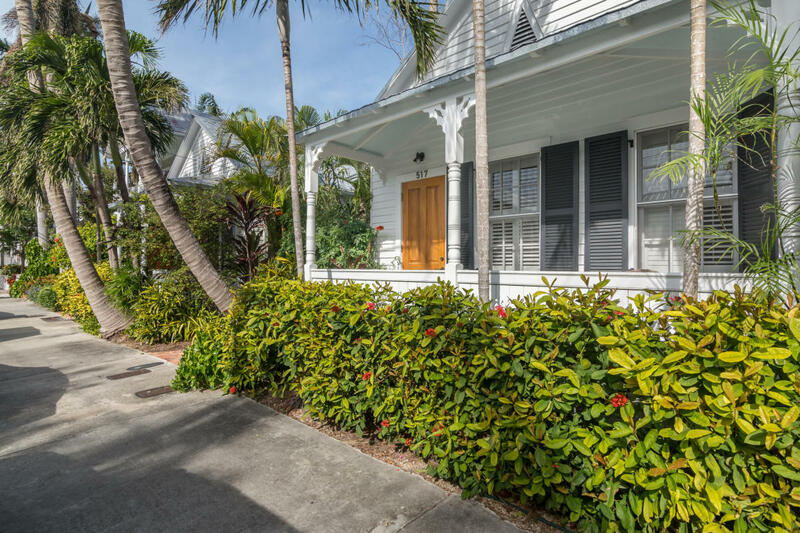 This entry was posted in Homes We Love, Key West Real Estate and tagged Classical Revival Architecture, cottage style, Florida Keys, front porches, Key West, Key West cottage style, Key West cottages, Key West homes for sale, key west real estate, Old Town Key West, Victorian gingerbread on December 22, 2018 by Dean. 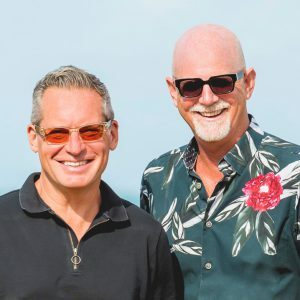 Since launching our weekly Facebook feature, ASK THE TOWNSEND TEAM, earlier this year, we’ve been answering the Key West questions on your mind. Your positive response has inspired us to commit to continuing the series for 2019. That’s 52 posts! What a challenge! These six ASK THE TOWNSEND TEAM posts garnered the most attention in 2018. We hope you enjoy reading them and learning something new along the way. SHOULDN’T I PRICE MY PROPERTY HIGHER, SINCE I CAN ALWAYS DROP THE PRICE LATER? While this strategy might have a positive ring for a seller, following it will likely result in a lower selling price. The most opportune time to sell a home is during its first few weeks on the market—when it attracts the greatest attention. When a property is overpriced, it competes with houses with more competitive features at that higher price level. Local real estate agents may refrain from showing the property because they feel it is priced too high. Consequently, the overpriced home is unlikely to attract an offer. The longer the home remains on the market the more likely potential buyers are to ask what is wrong with the property. Eventually, the seller will have to reduce the asking price. The fact that the home has had a price reduction after being for sale for an extended period will almost certainly be factored into an even lower offer for purchase. WHAT’S NEW ON THE KEY WEST RESTAURANT SCENE? Run don’t walk to the fabulous new Moondog Café & Bakery on Whitehead Street and our longtime favorite, The Flaming Buoy Filet Co., at its new location on Eaton Street! We eat out every night and consider ourselves to be less foodies and more professional diners—loving locally owned places with great food and welcoming environments. These two restaurants have captured our taste buds and our hearts. We bet you will enjoy them as much as we do! 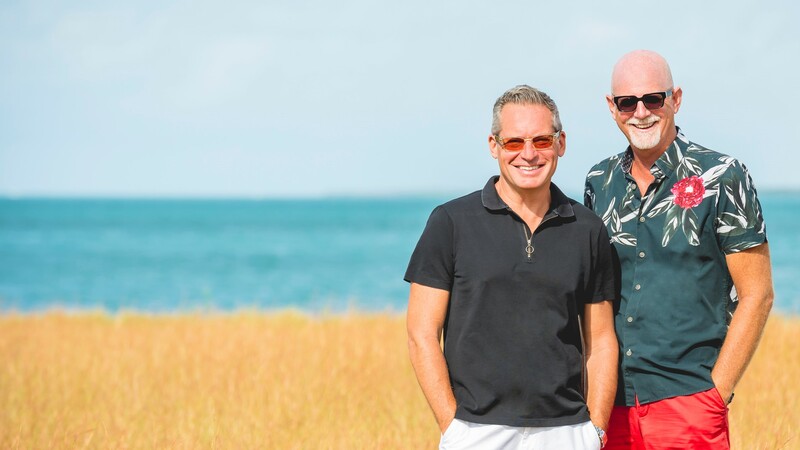 The remarkable culinary team behind legendary Key West eateries The Café and Banana Café has created the not-to-be-missed Moondog Café & Bakery. Located next to the historic Hemingway House, the imaginatively designed art-filled café is open for breakfast, lunch and dinner. Instantly becoming one of our go-to dining destinations, we’ve been working our way through Moondog’s delightful menu. We love the Seafood Omelette, Norman’s Huevos Rancheros, Fresh Spinach & Artichoke Dip, Grilled Caesar Salad, The Frenchman Burger, and Roasted Mushroom & Fontina Pizza. After way too long a wait, Scot, Fred and their extraordinary team are back with their stylishly funky and fabulous new Flaming Buoy on Eaton Street. We were thrilled to be invited to rub elbows with Key West celebrities at their soft opening last Saturday evening. We loved the amazing new décor and our all-time favorites, the Seafood Mariana and The Filet Co. Three Way. It is great to have The Flaming Buoy back and better than ever! I’M PAST RETIREMENT AGE. AM I TOO OLD TO GET A MORTGAGE LOAN TO BUY A HOME? As long as your creditworthiness qualifies you for the mortgage loan you are seeking, The Equal Opportunity Credit Act assures that you will not be charged more or denied a loan because of your age. So far this year, we have had an over-eighty customer finance the purchase of his Key West by the Sea condominium and a first-time home buyer over seventy purchase her Old Town cottage. The driving force in both of their decisions to buy was a desire to not have to move again. 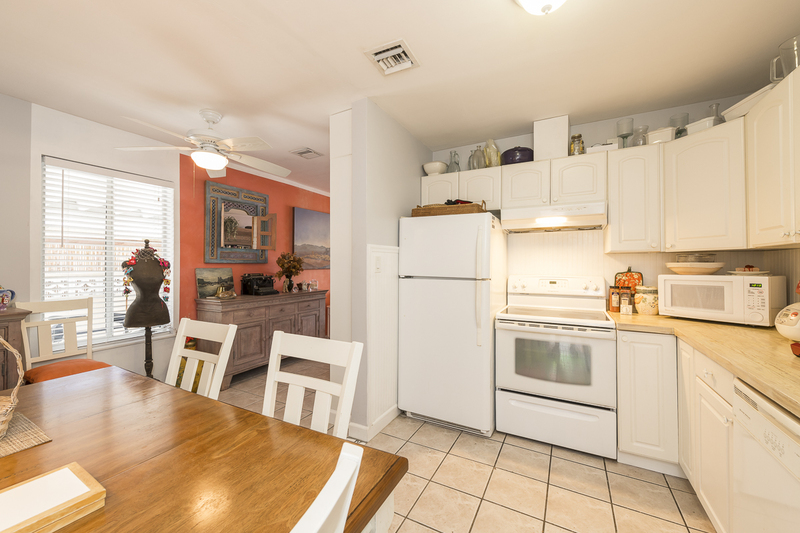 WHAT’S THE DEAL WITH KEY WEST TRANSIENT VACATION RENTAL PROPERTIES? 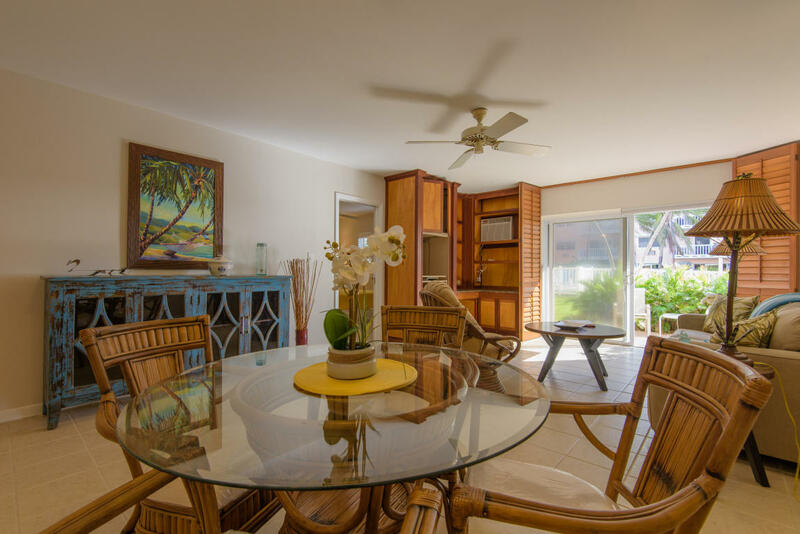 Unless your Key West property is part of a condominium or homeowners association with rules governing vacation rentals, with the correct City of Key West license anyone can offer their home as a vacation rental. 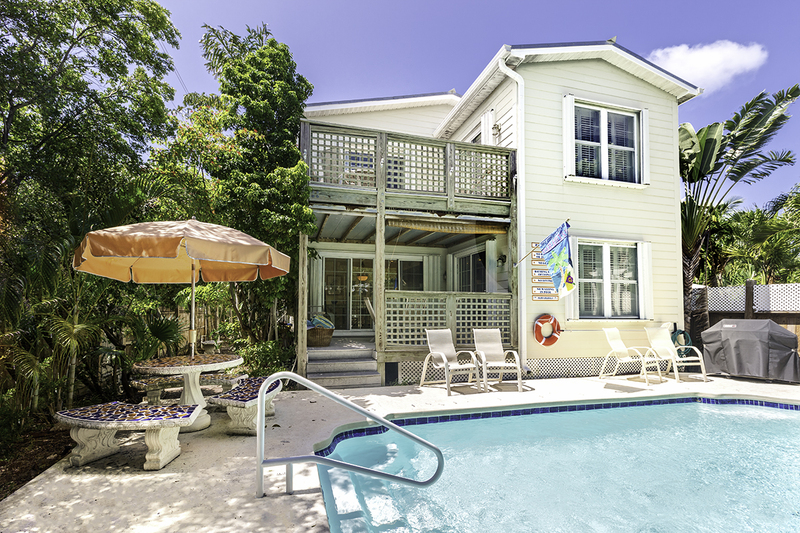 There are two types of vacation rental properties in Key West: those with transient rental licenses and those with standard rental licenses. 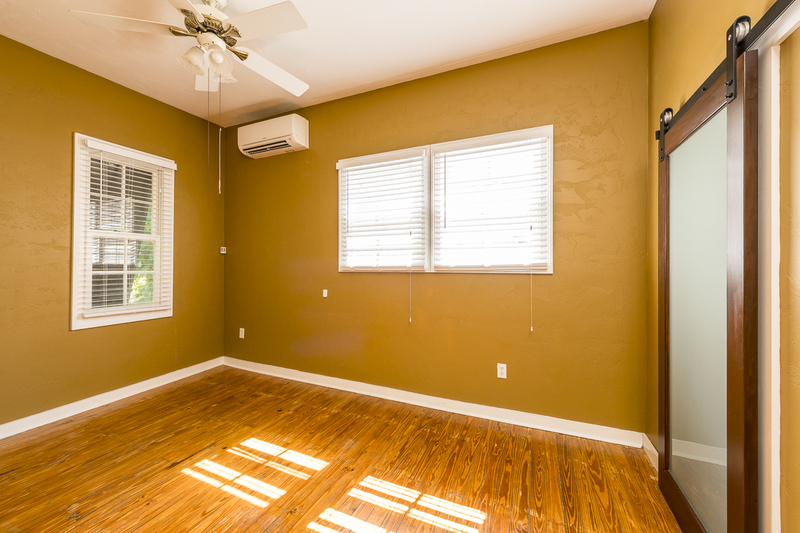 Most Key West transient rental properties are located within half a block of Duval Street, on Truman Avenue, and along Eisenhower Drive. There are properties with transient licenses in the 1800 Atlantic, Key West Beach Club, La Brisa, Sunrise Suites, and Marriott Beachside developments. Truman Annex homes may have a special transient license that is subject to a weekly minimum and has a sunset clause attached. Additionally, there are grandfathered-in transient properties peppered across the island. A typical transient license allows a property to be rented nightly, weekly, monthly, or yearly. Transient licensed homes can be operated much like a hotel. While they require higher levels of management, they offer greater flexibility and the potential for high returns. 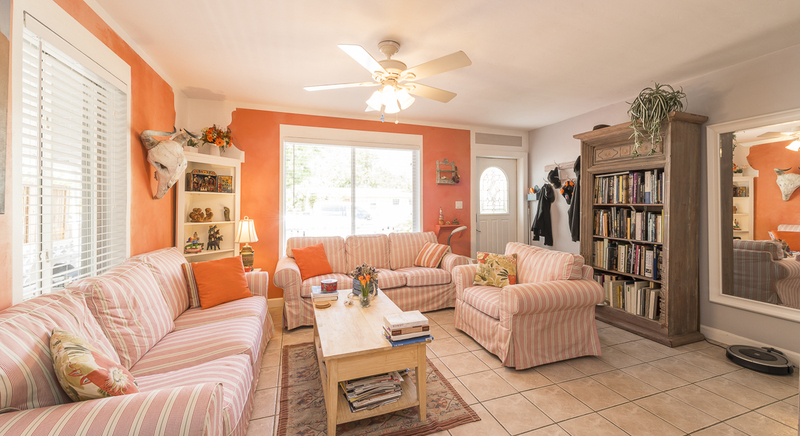 Since transient rental vacation properties often attract short-term visitors that are coming to Key West to party, they can suffer more wear and tear than long-term vacation rentals. Homes with transient licenses typically sell for $75,000 to $100,000 more than like-kind properties that do not have a transient license. Transient licenses can be bought and sold but can only be placed on receivership sites designated by the city. 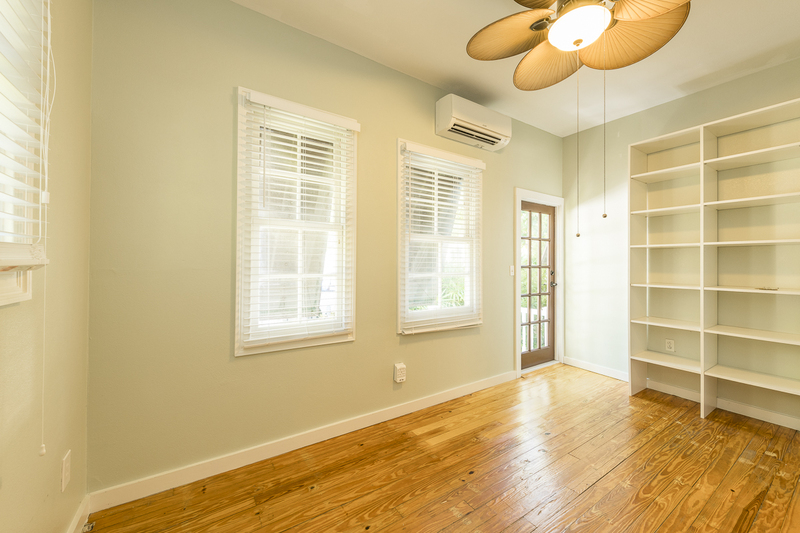 A standard City of Key West rental license allows for a home to be rented for 28 days or more (think monthly, with February being the shortest month at 28 days). Those renting for a month or longer are typically older couples that have the time and money to vacation in paradise for an extended period. Even larger properties are usually occupied by a couple for most of their rental period, with friends and family joining them for short visits. Consequently, long-term vacation rental properties suffer much less abuse than transient rentals. 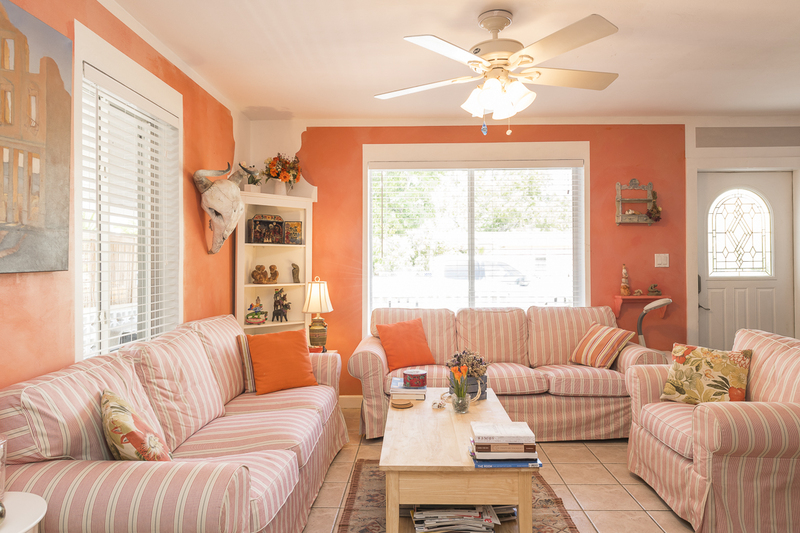 When they are staged to feel like a home, rather than a hotel room, long-term vacation rentals tend to attract repeat visitors and higher occupancy rates. THERE WAS A DEATH IN MY HOME. DO I HAVE TO DISCLOSE THE FACT TO POTENTIAL BUYERS? Florida law is clear on the subject. It states that if your property was the site of a death, homicide, or suicide it is not a material fact that must be disclosed. Further, according to Florida law, HIV and AIDS status are not material facts that must be disclosed in a real estate transaction and no cause of action arises against a homeowner or REALTOR® for failure to disclose that the occupant of a property is infected with HIV/AIDS. Interestingly, Florida law is silent on haunting. If you believe that your house is haunted, it would be best to consult your legal counsel and perhaps a medium. WHAT ARE THE DIFFERENCES BETWEEN A NOTE, A MORTGAGE, AND A DEED? In a nutshell, the note is the borrower’s promise to pay back his or her loan, the mortgage is putting up the property as security for the note, and the deed transfers ownership of the property. The promissory note (note) is the borrower’s promise to pay. The closer presents the note for the buyer’s signature. The note shows the principal balance, number of payments, and the dates and the amount of the payments. The amount will be for principal and interest only. The first payment date will normally be the first day of the second month after closing. The note is not witnessed or notarized. If a signature appears on the face of the note along with the borrower’s signature, that person becomes a cosigner on the note. The mortgage is the security for the note. It is the document that may require the borrower to pay 1/12 of the ad valorem taxes, hazard insurance, and mortgage insurance premium along with the principal and interest required by the note. It requires that payments be made on time, taxes be paid, and the property be covered by insurance. It also describes payment options and probably states that a transfer of the property will make the loan due immediately. The general warranty deed (deed) is the document that transfers ownership of the real property. The general warranty deed is the most common deed, with the seller’s guarantee to the buyer that he or she has good title, without material defects or encumbrances, and will stand by the guarantee forever. Special attention should be given to names, legal descriptions, and any items in the “subject to” section, such as restrictive covenants and mortgages. 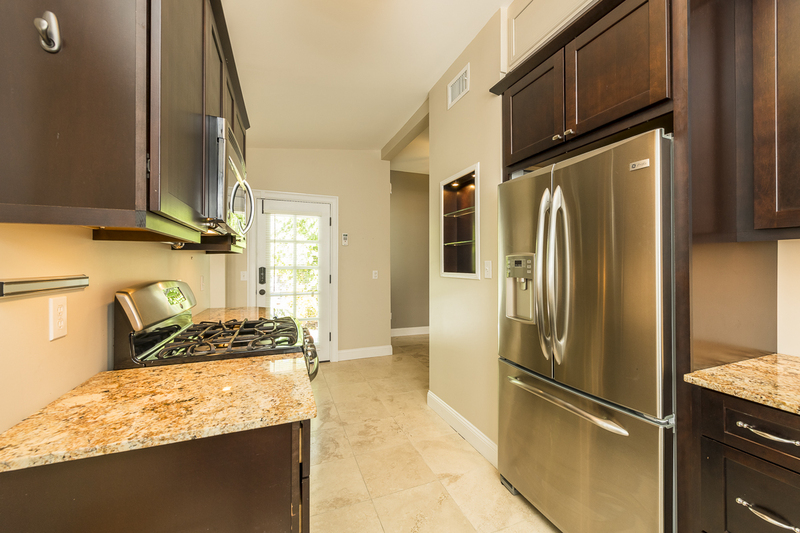 Do you have a question about buying, selling, or investing in Key West real estate? Are you pondering the ins and outs of living on our tropical island? Wondering what’s new in Paradise? Email your questions to info@DeanTownsend.com and look for our responses every Wednesday on our Townsend Team Facebook page. This entry was posted in Ask The Townsend Team, Key West Real Estate Advice and tagged Ask The Townsend Team, Dean Townsend, Florida Keys, Keith Townsend, Key West, key west real estate, Key West restaurants, real estate, The Townsend Team Key West on December 20, 2018 by Dean. 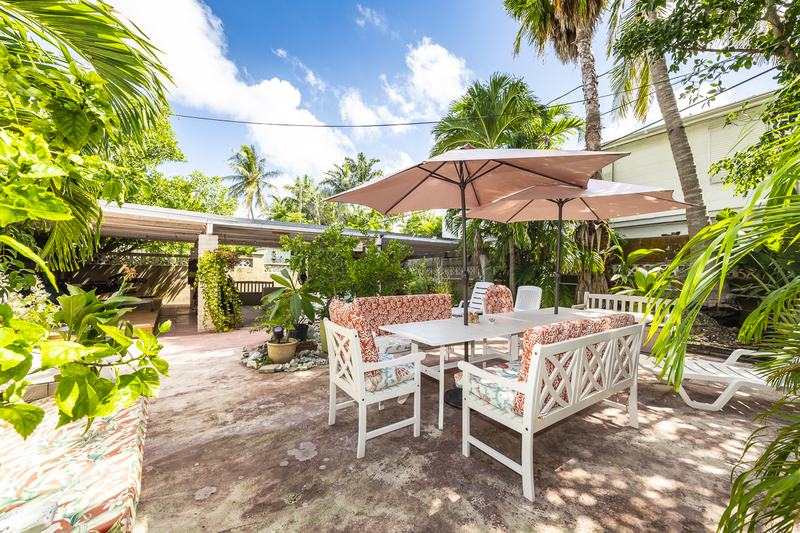 700 Pearl Street, Key West, FL 33040—$775,000. Is it finally time to trade the Johnny Paycheck ditty turning over in your head for a tropical Jimmy Buffett tune? 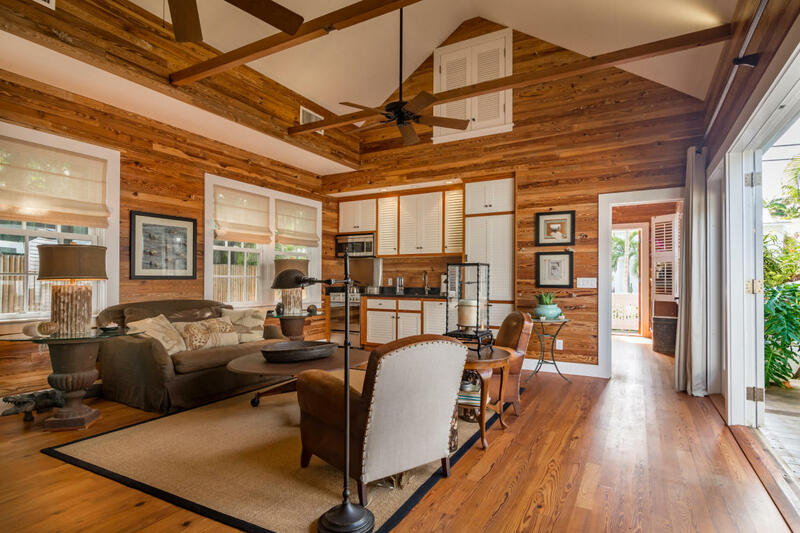 The captivating Key West cottage at 700 Pearl Street might be your catalyst for quitting your job, selling your house and making your move to paradise. 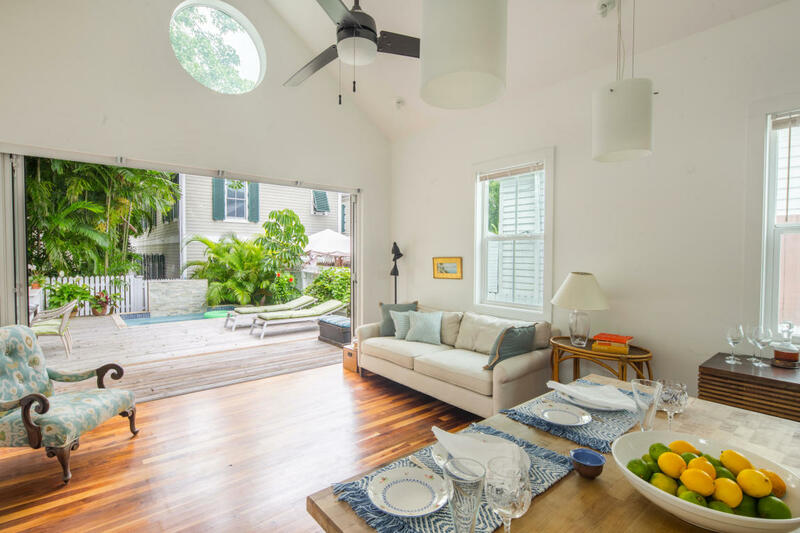 Nestled at the end of a quiet street in historic Old Town’s coveted Meadows neighborhood, this beautifully renovated fisherman’s cottage skillfully blends contemporary design with Key West character. The one-of-a-kind two bedroom and two bath home features high ceilings, travertine and wood floors, gorgeous kitchen and baths, and abundant windows and doors. 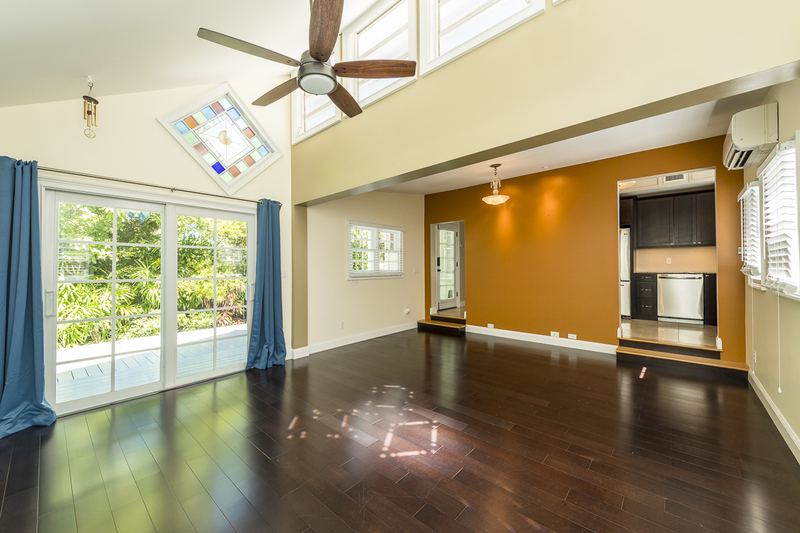 The light-filled living room showcases a vaulted ceiling and island-inspired stained glass windows. Ideal for enjoying the best of indoor/outdoor living, the living room flows to the dining area and out to the sun-dappled deck. Showcasing custom cabinets, granite countertops, stainless steel appliances, gas range, built-in microwave and farmhouse sink, the well-designed kitchen cannot be missed. 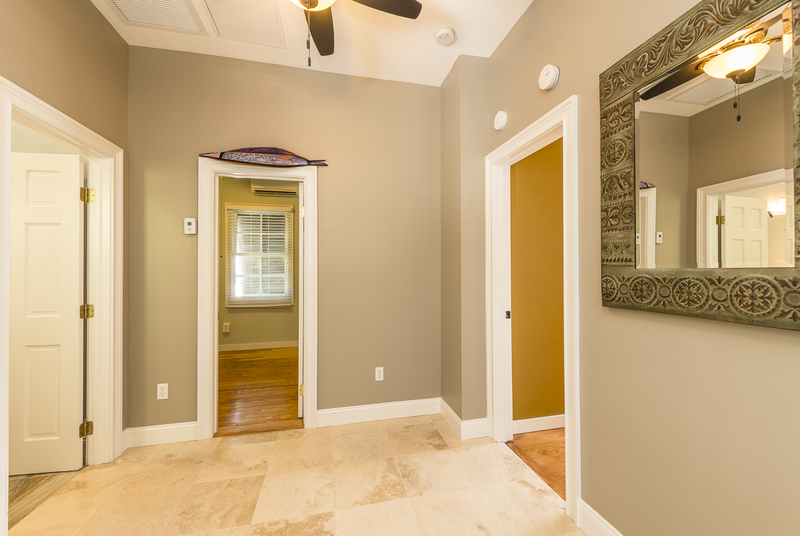 The entry hall offers design possibilities with room for a café table, writing desk, or reading nook. The guest bathroom is a delight. 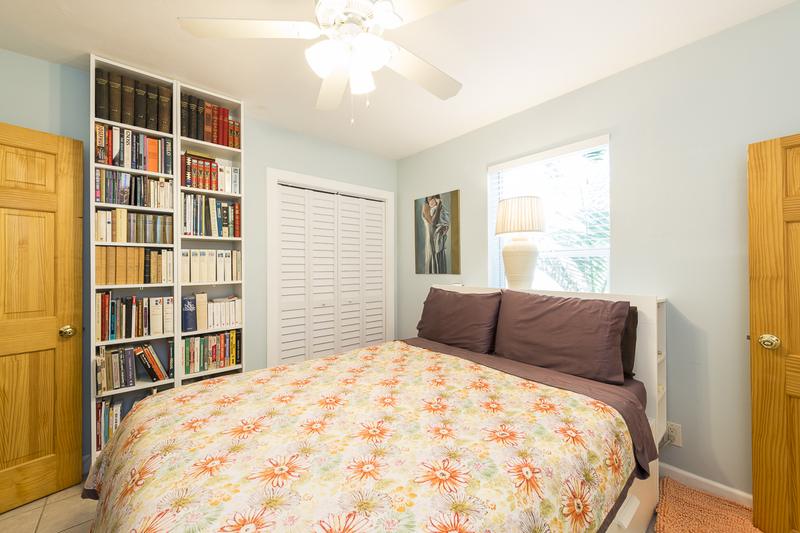 Friends and family will be booking their next visit once they have enjoyed the bright and inviting guest room. 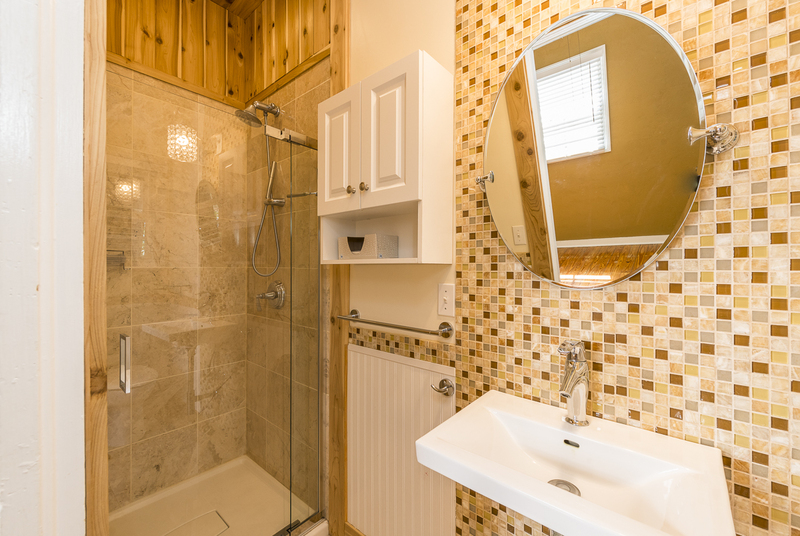 The peaceful master suite features frosted glass barn doors and stylish bath. 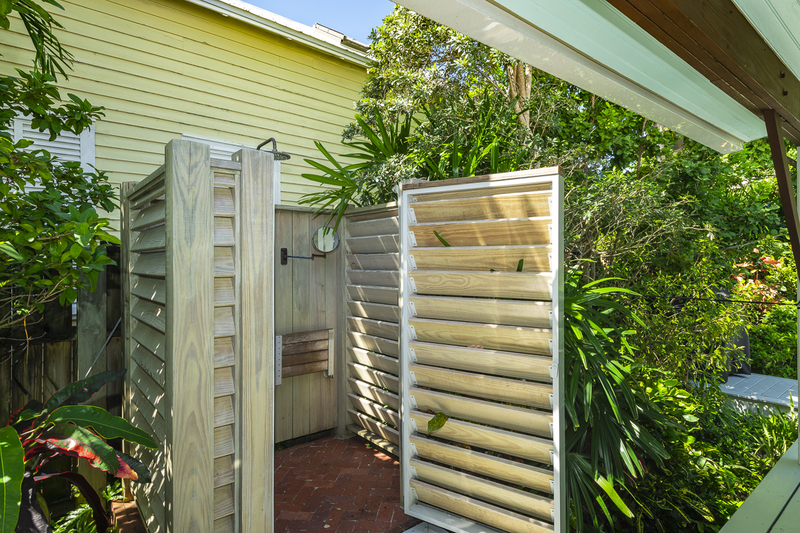 The outdoor shower in the garden is to die for. Cooking is made easy with the gas grilling station. 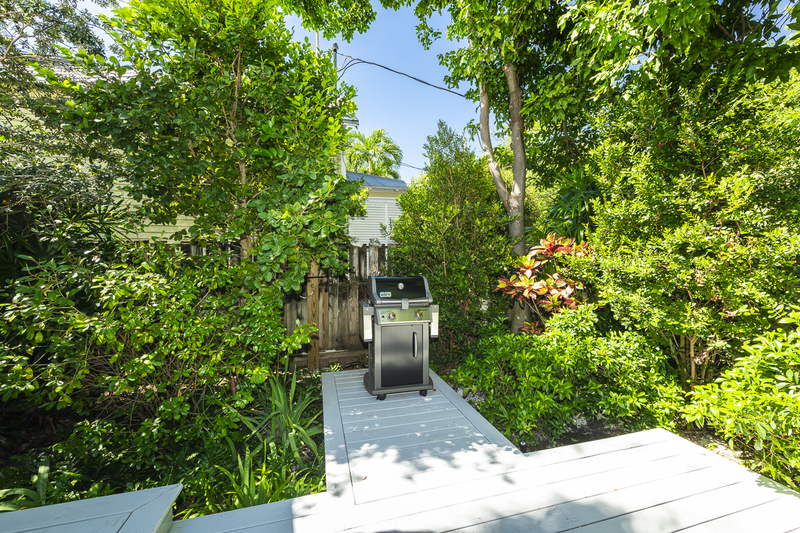 The lushly planted corner lot includes Key Lime and Spanish Lime trees, irrigation system and landscape lighting. The spacious deck is perfect for outdoor entertaining. We can’t wait to give you a private tour of this unforgettable Key West gem. Bet you will love it as much as we do! This entry was posted in Homes We Love, Key West Homes For Sale, Key West Real Estate and tagged cottage style, fisherman's cottage, Florida Keys, front porches, homes, Key West, Key West cottage style, Key West cottages, Key West history, Key West homes for sale, key west real estate, Old Key West, Old Town, Old Town Key West, real estate, The Meadows on October 22, 2018 by Dean. 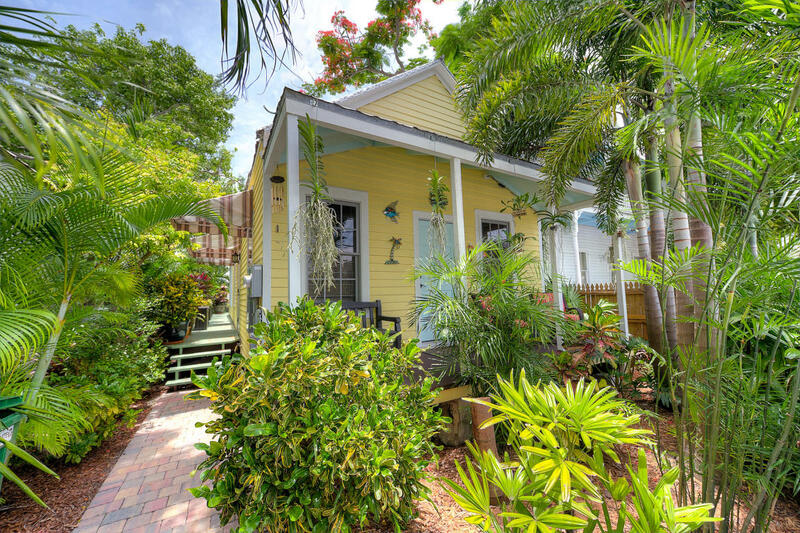 1606 United Street, Key West, FL 33040—$659,000. Create your Key West vision in this bright and sunny Midtown home. 1606 United Street’s centrally located family-friendly neighborhood will have you living island life like a local in no time. The light-filled living room opens to an inviting dining area and kitchen. 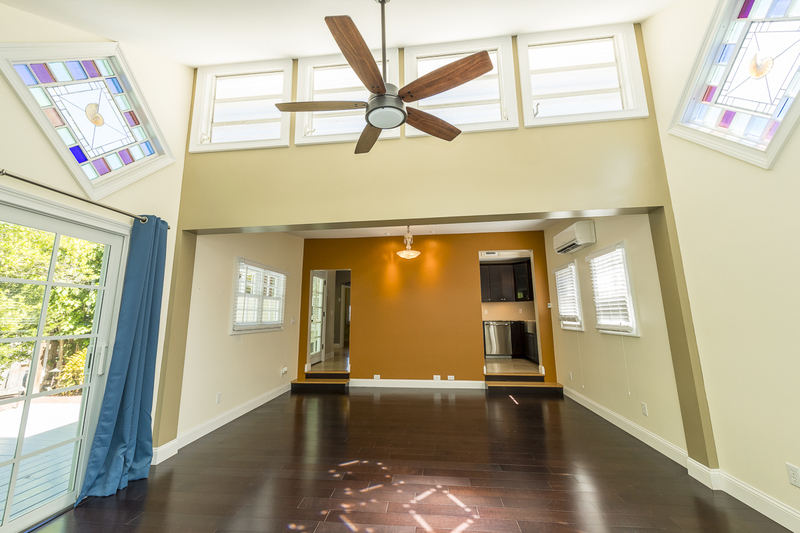 Built in 1958, the nicely renovated single-story home features a contemporary floor plan in 1,216 square feet of indoor living space. 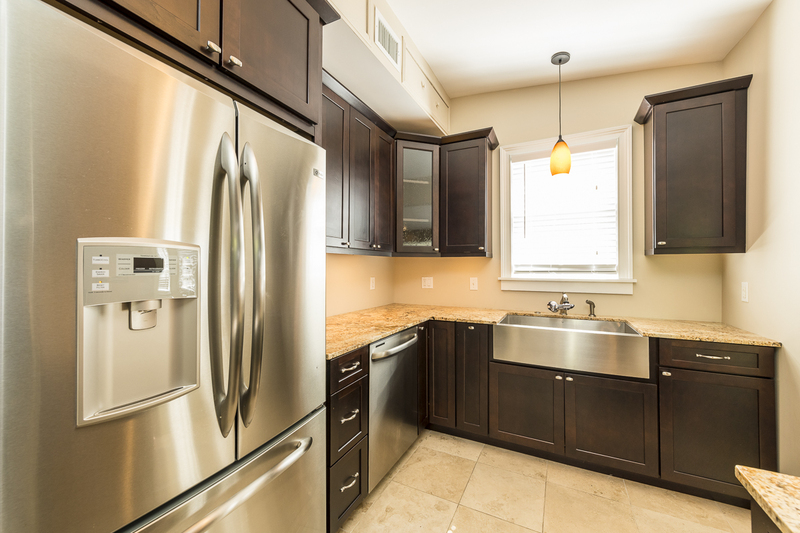 The charming kitchen flows to the laundry, generous storage and the backyard. Offering many lifestyle options, the first of three spacious bedrooms is currently being enjoyed as an artist’s studio. 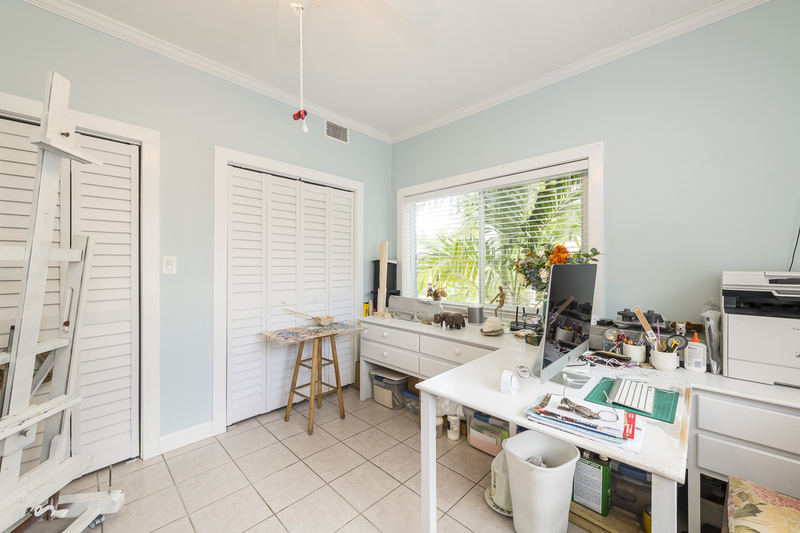 Awash with sunlight and views of the garden, it has proven to be a rewarding creative space. 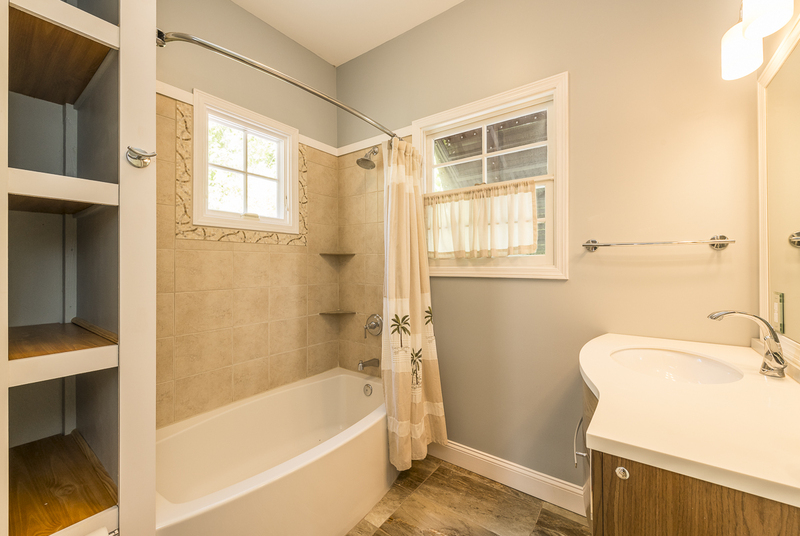 Currently utilized as the master, the second bedroom has its own half bath opening to a delightful outdoor shower. 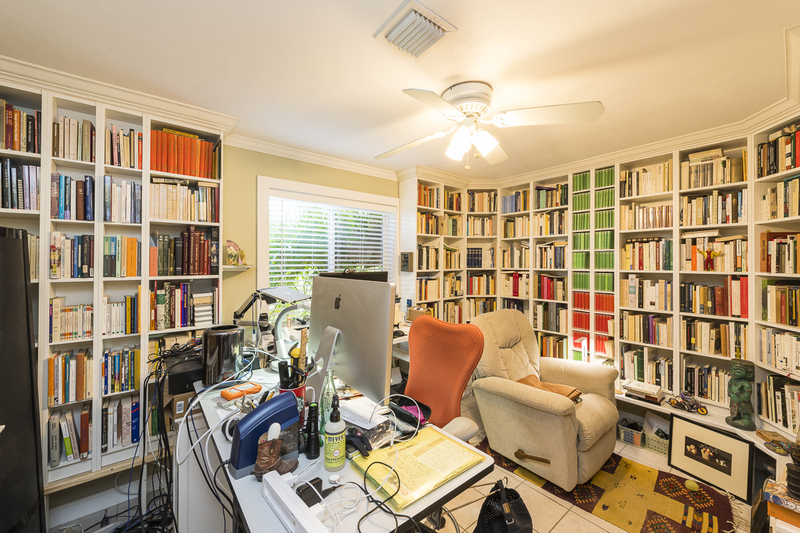 The third bedroom now serves as a library and office. 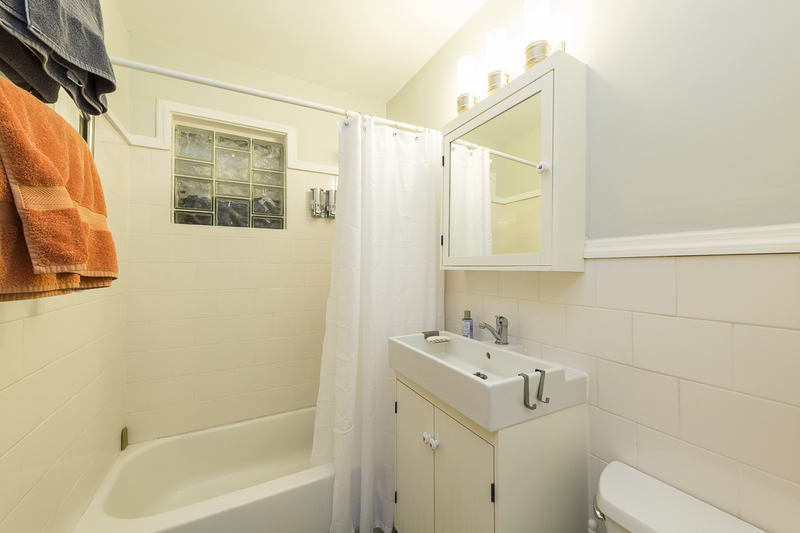 The home’s main bath has been recently updated. Welcome home to Key West. There is plenty of room for the pool of your dreams! 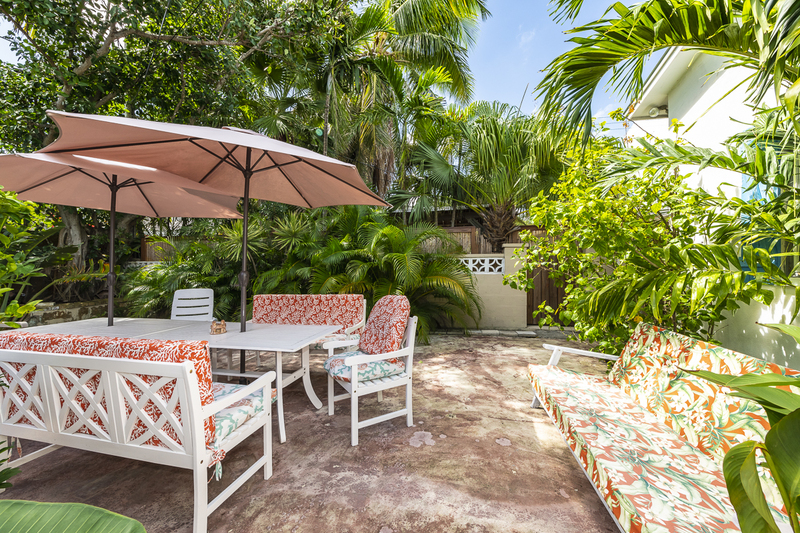 Substantial covered outdoor space allows for entertaining and enjoying hobbies in the tropical backyard. 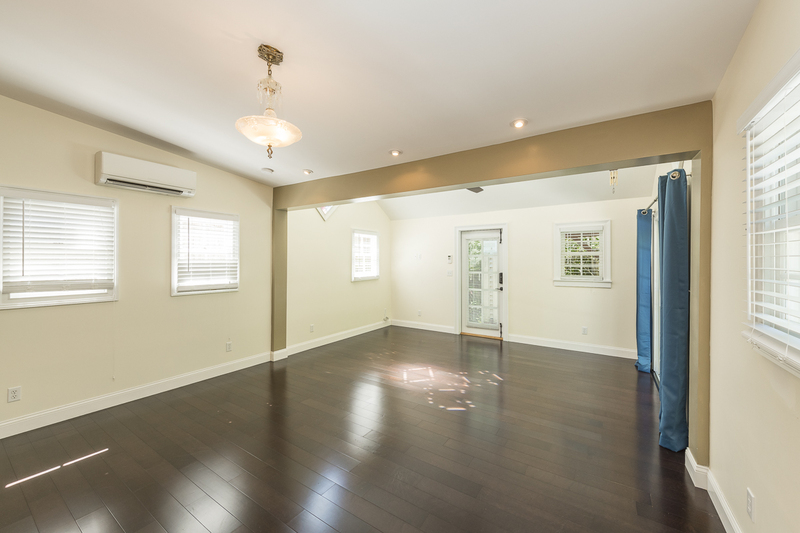 The 5,141 square foot lot is fully fenced and offers covered tandem parking for two cars. 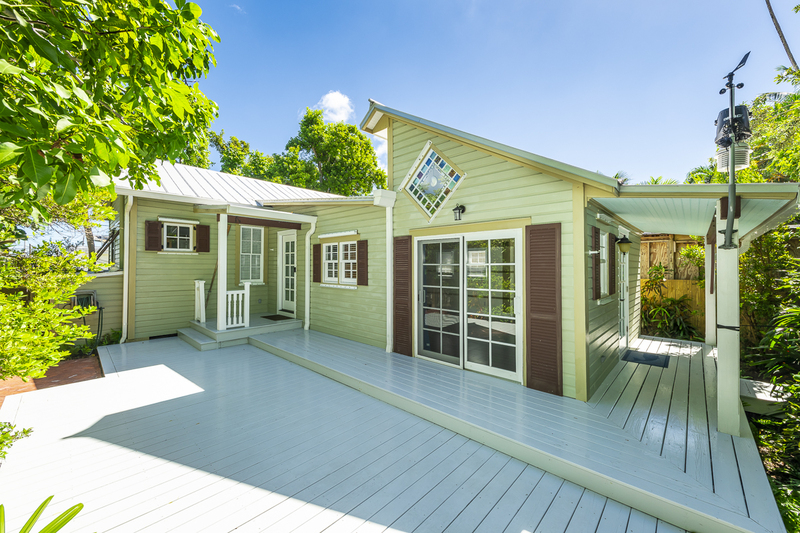 With a new roof, storm shutters and door dams this move-in-ready Key West property is not to be missed. We would love to give you a private tour of this wonderful island home. 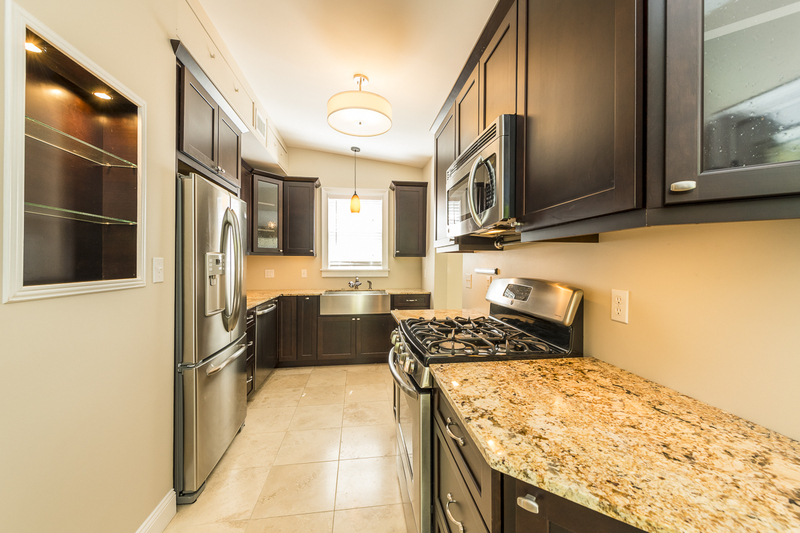 We bet you will enjoy our new listing as much as we do! 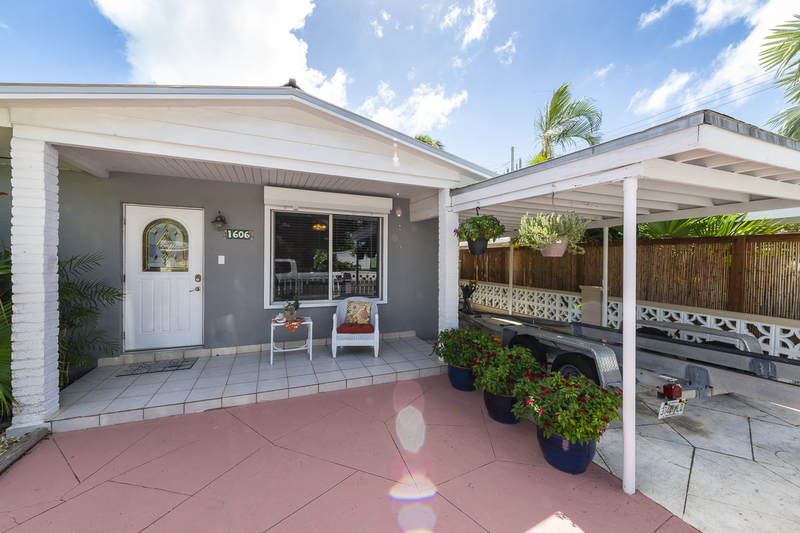 This entry was posted in Homes We Love, Key West Homes For Sale, Key West Real Estate and tagged Florida Keys, homes, Key West, Key West homes for sale, key west real estate on October 20, 2018 by Dean.